As with all Tweets like this, it had its share of supporters and detractors. Though I was being tongue-in-cheek, I was also sort of being serious. 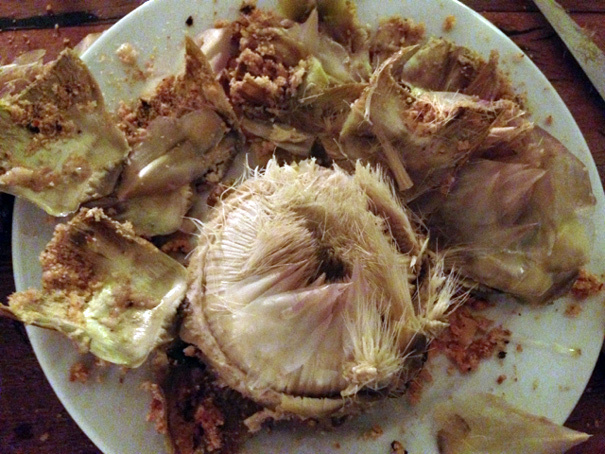 I hate dealing with artichokes. For my cookbook, the terrific chefs Alex Raij and Eder Montero taught me how to make a gorgeous spring vegetable confit with fava beans and asparagus and lots of green things including the dreaded artichoke. In their kitchen at Txikito, Alex showed me how to cut through the top of the plant, how to trim the stem, how to cut out the choke. When we were done, what looked like a bowling ball suddenly looked like a ping pong paddle. Did it taste good after it was confited? Yes. But was this something I’d really want to do in my own kitchen? Not really. 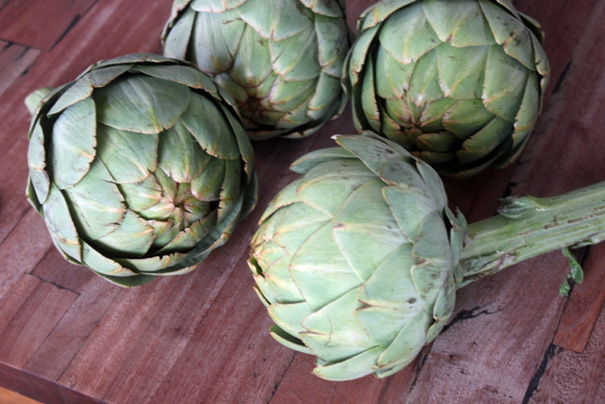 When it comes to artichokes, I’m happy to eat them. But prepping them is the pits. This was before slicing my hand on the squash. Vegetables are dangerous. Would I go through the hassle of trimming these all the way down and throwing away all the leaves and stem and chokey bits to yield a minor, little reward for my dinner guests? Not this time! 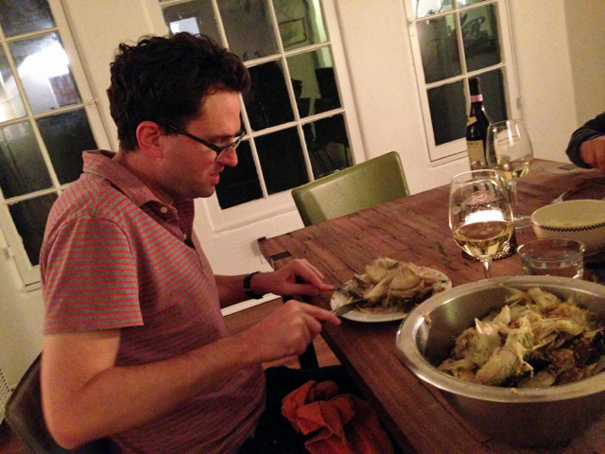 I recalled the shock that Zach Brooks and Luke Matheny expressed on The Clean Plate Club when I told them that I’d never cooked a whole artichoke. 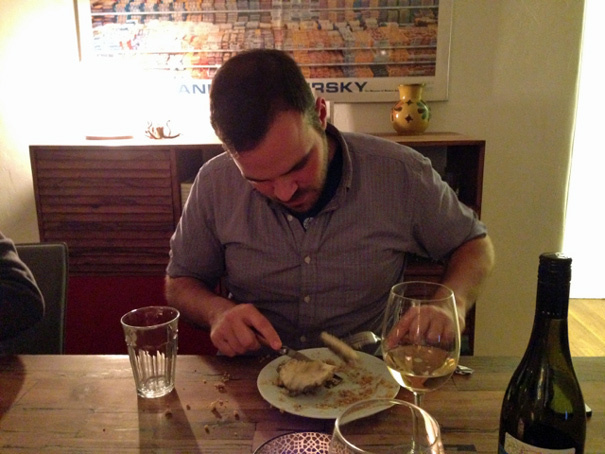 Just the normal way, where you don’t do anything except cook it and eat it. That’s what I’d be doing this Wednesday night. 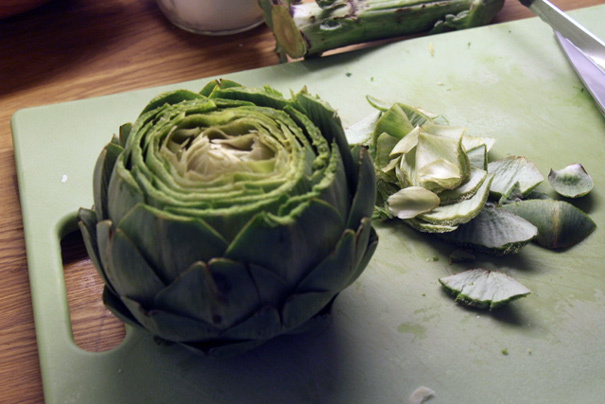 Prep wise, you just slice the tops and bottoms off the artichokes. 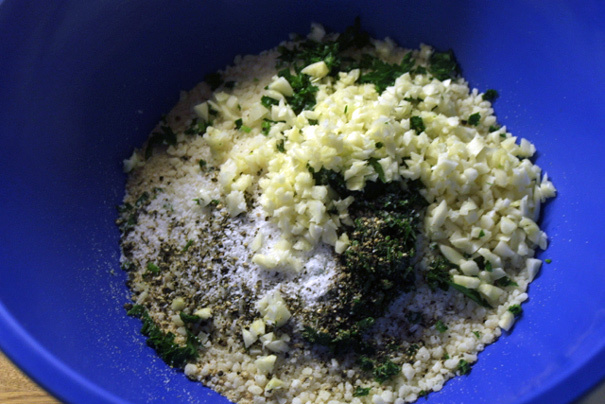 Then you stuff them with the filling and drizzle them with olive oil. Your pour boiling water into the baking dish and then cover everything with foil. 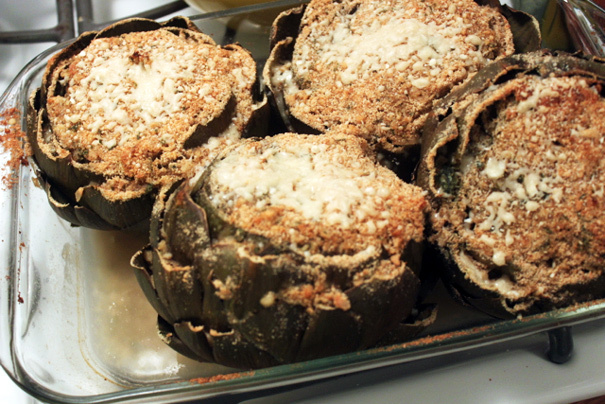 This allows the artichokes to braise in the oven; then, after 40 minutes or so, you remove the foil and allow the tops to brown. That’s it. Because I heard someone say recently that the best part about eating artichokes is dipping the leaves in mayonnaise, I made a dipping sauce by stirring mayo together with lemon juice. 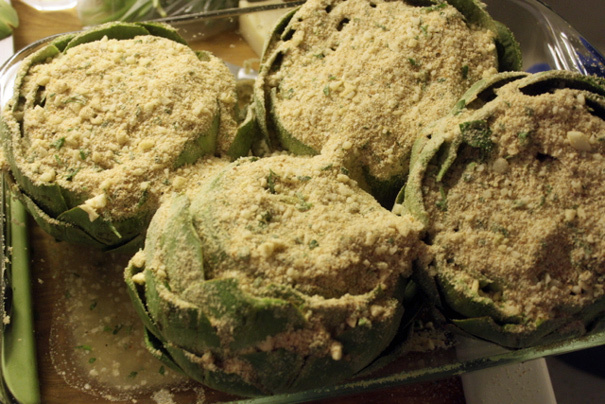 Then I presented these artichokes to my guests, one each. So here’s the deal: that hairy center chokey bit is inedible. And you have to cut it out to expose the heart. 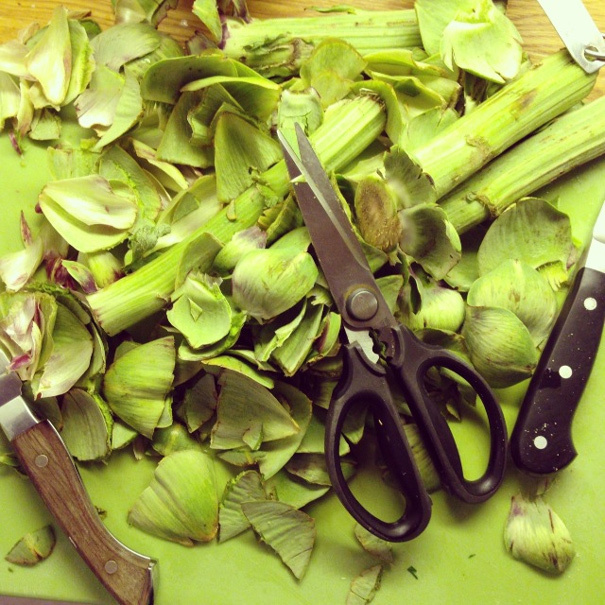 If I had to do it all over again, I might’ve cut out the hairy bit before stuffing the chokes. But I’m not even sure how I’d do that. All I know is that artichokes are like relationships with good looking narcissists: it’s a lot of work for a debatable reward. For some, they’ll defend their good looking narcissist to the grave. “You don’t see his good qualities!” Me? 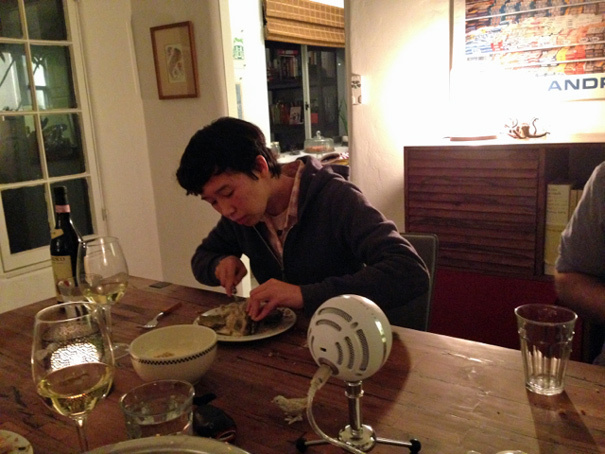 I’m not breaking up with artichokes, per se, but I think we need to see other people. Star-crossed lovers, we are not.